Carmen and Marcus enjoying a night at the circus c.2006. In 2001, at the age of 35, I was pregnant with my first child. Since I am a paraplegic this wasn’t a decision I took lightly because additional health considerations had to be weighed. Much to my delight the pregnancy went well and I didn’t avoid swollen ankles, along with cravings (my indulgence of choice was Popeye’s Chicken the first trimester). At forty weeks, to the day, I delivered my beautiful baby boy – Marcus Solomon Jones. Upon delivery Marcus couldn’t breathe. The doctors began to panic as he lost color. The medical team had difficulty placing an endotracheal tube down his airway for additional support. Once secure, the hospital decided he needed to be transferred to a hospital with a Level 4 neonatal intensive care unit (NICU). In an instant, his Dad and I went from palpable joy to utter fear. 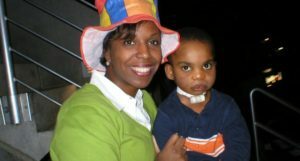 The surgeons discovered Marcus had a tiny (think: coffee stirrer) trachea and required surgery to insert a tracheostomy tube. He also had a cleft lip and palate, which made it difficult for him to swallow, which resulted in another surgery to insert a g-tube for feeding. He encountered several setbacks, the first year, and we almost lived in the NICU. When he was finally released from the hospital, we had 24/7 nursing care and my home’s second floor became a medical unit. It was hard to wrap my mind around the initial excitement of having a baby, being dashed by a life filled with daily therapy sessions, mounting medical expenses, strained relationships and social isolation. When I woke each day and Marcus was still alive, I considered it a small miracle. Really. While I’d started the Solutions Marketing Group a couple years earlier, and my team and I had done amazing work to advise and build disability inclusive strategies for Fortune 500 companies, I didn’t know one thing about the disability parenting culture. I had to figure out our new normal, which was a long process filled with tears, lots of medical appointments, and helping bridge my son’s developmental gap. My breakthrough occurred while working on a market research project in Florida. A client engaged SMG to gain insights about individuals with disabilities and their families. While moderating the groups, I listened to parents share how they adjusted their expectations and family life. My AHA moment occurred during my interaction with respondents and my heart soared with excitement. While this wasn’t a path I’d choose, I felt less alone and saw an opportunity for my company. I discovered Census Bureau data that of the 70 million families in the U.S., 19 million families have a member with a disability. I knew families like mine wanted to hear from companies, like my client, assuring them they were understood. I decided to harness my personal experience and marketing expertise to deepen SMG’s portfolio to guide clients to target, employ and serve families in a bigger, bolder way. Make Business/Employee Resource Groups Inclusive of Family Members: Many companies have affinity groups for employees with disabilities. An effective way to support employees with a family member with a disability is by providing a group for them. This platform offers a safe space for them to share resources, insights and peer support that is often needed. Provide Product/Service Enhancements Families Need: When my family went to Disney World Marcus was four year’s old son, wasn’t toilet trained and fed via g-tube. Prior to our trip, I did research and discovered Disney had private areas throughout the park, which allowed me to privately take care of his personal needs. Disney did their research and provided value families now enjoy without missing a beat. I suggest doing research to understand and identify specific enhancements your organization can make to meet the needs of families. Create Seamless Experiences for the Whole Family: Children with disabilities require a lot of attention from their parents. Typical siblings have told us this has an impact, as they have often felt overlooked. Your organization will win big by creating experiences the whole family can seamlessly enjoy. 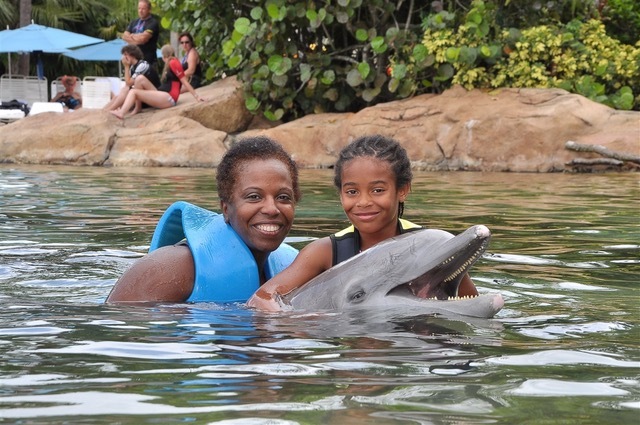 This can include a dedicated night for the whole family to enjoy a restaurant, theme park or movie. Or, it can include an event just for siblings of kids with disabilities. Assuredly, as your organization strategically and authentically positions itself to meet the needs of families it will have a ripple effect that changes organizational culture and employee morale, garner positive public attention, and build a brand loyal relationship with consumers who are waiting to be reached.